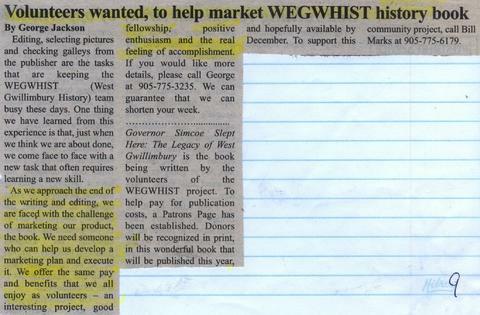 ItemPH26695 - Help market WEGWHIST! Description : As we approach the end of the writing and editing, we are faced with the challenge of marketing our product, the book. We need someone who can help us develop a marketing plan and execute it. We offer the same pay and benefits that we all enjoy as volunteers - an interesting project, good fellowship, positive enthusiasm and the real feeling of accomplishment. Governor Simcoe Slept Here: The Legacy of West Gwillimbury is the book being written by the volunteers of the WEGWHIST project. To help pay for publication costs, a Patrons Page has been established. Donors will be recognized in print, in this wonderful book that will be published this year, and hopefully available by December.